Either you're born a clown or your not! And you can tell the ones who truly are clowns with or without their make-up on; especially if you're under the age of eight. 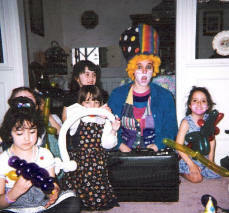 Professor Giggles has been a clown all her life, and clowning around professionally since 1988. In school she was the favorite class clown and the one who was asked by peers and teachers alike to entertain whenever the occasion called for it. Having gone through some serious post secondary clown training with the Ringing Brothers, circus clowning was not the life she wanted. With a degree in Balloonology and more than just B.S. in child psychology Professor Giggles is a gifted children's entertainer. Always serious about cLowning, Professor Giggles began the teaching aspect to her cLowning as an elementary school teacher's aide educating and entertaining simultaneously. As an "edutainer" the focus being on self-esteem, a can do attitude and understanding all entwined with humour; which is still very much a part of her and her performances.